If you would like to be sure that this museum still exists on your next visit, please make a small DONATION (see CONTACT). 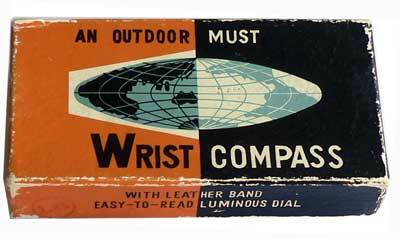 The ANCESTOR of all wrist compasses? PROFILE - Manufacturer not identified. 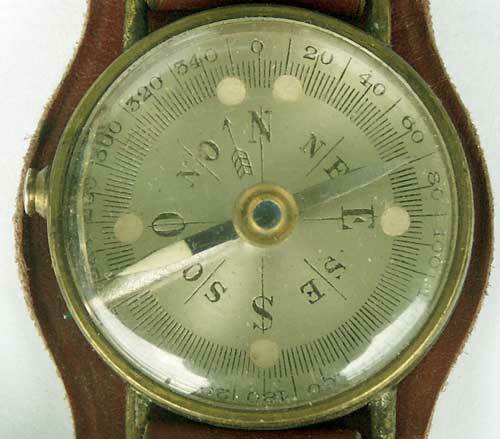 Is this one of the very first wrist compasses ever made (late 19th C.?). 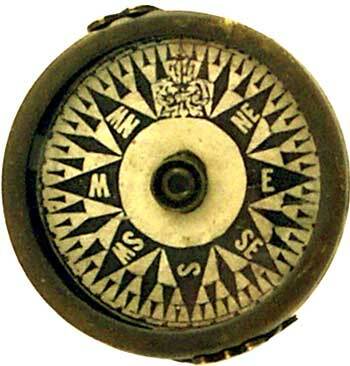 The compass card's design is identical with traditional ships' compasses. 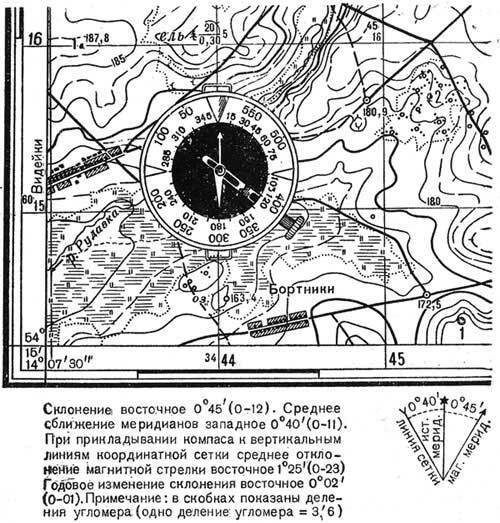 The card features 64 divisions, a number also used on military compasses to assess distances (see the pull-down menue point MISCELLANEOUS / Divisions). 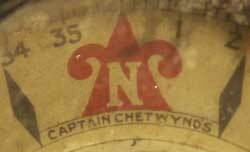 - Divisions: 64 rumbs, main and semi cardinals abbreviated, North: fleur-de-lis (heraldic lily). 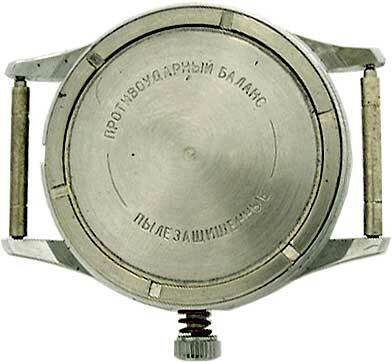 Description: This instrument is a further development of a marching compass model patented in 1907 by the Russian cartographer Vladimir Nikolaievich ADRIANOFF (link to photography and biography, * Feb. 22, 1875 in St-Petersburg - August 24, 1938 in Ostashkoff). 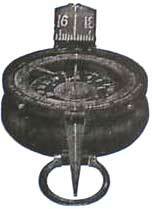 It was called ADBER and in use in the Army's Survey Corps. A later slightly different version was also made at least for a client in Norway and it also appears in a BUSCH catalogue (no. 3350). 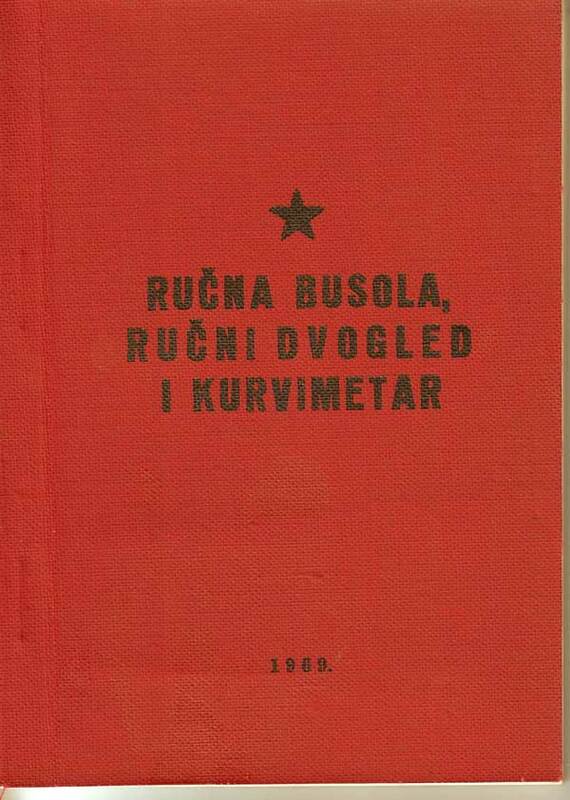 The item below is identical to the AURKKA and ZUP models used in the USSR's Red Army but it is a special version for Bulgaria and the former Yugoslavia, in the regions writing in cyrillic letters, i.e. Serbia. 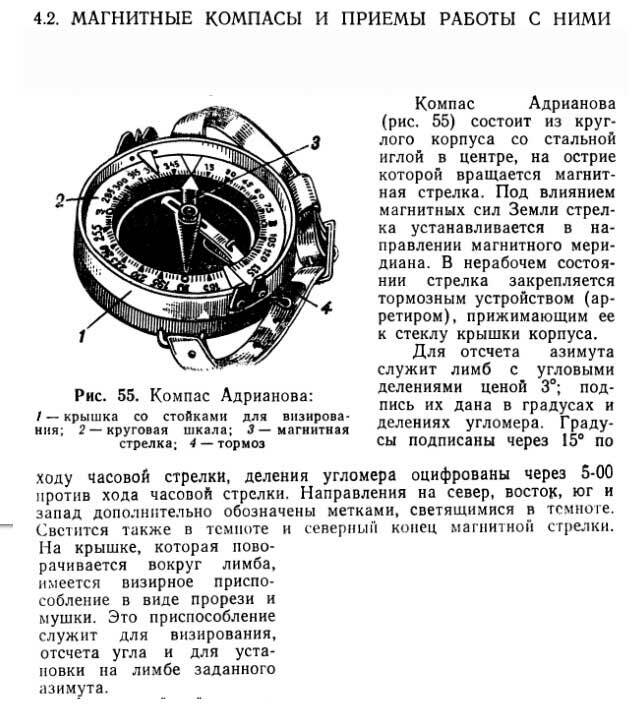 The only difference with the Russian version is the letter used for the cardinal point EAST (located underneath the figure 450 mils and between 75 and 105 degrees) and which stands for the word изток (abbrev. и = i, pronounce iztok) in the Bulgarian and Serbo-croatian languages while it is восток (pronounce vostok, abbreviated B) in Russian. 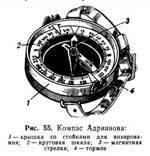 It was also called Adrianoff's compass (Компас Адриаиова / Adrijanova busola) in the communist countries' army manuals. 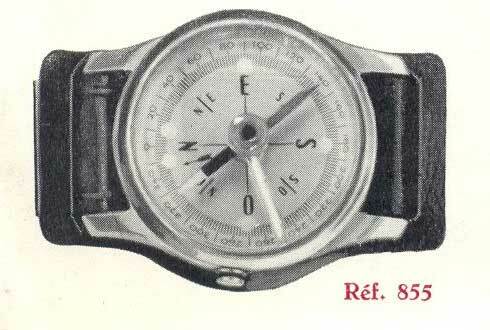 A similar compass type was also manufactured for a short period in the former communist East-Germany by ASKANIA (see below). 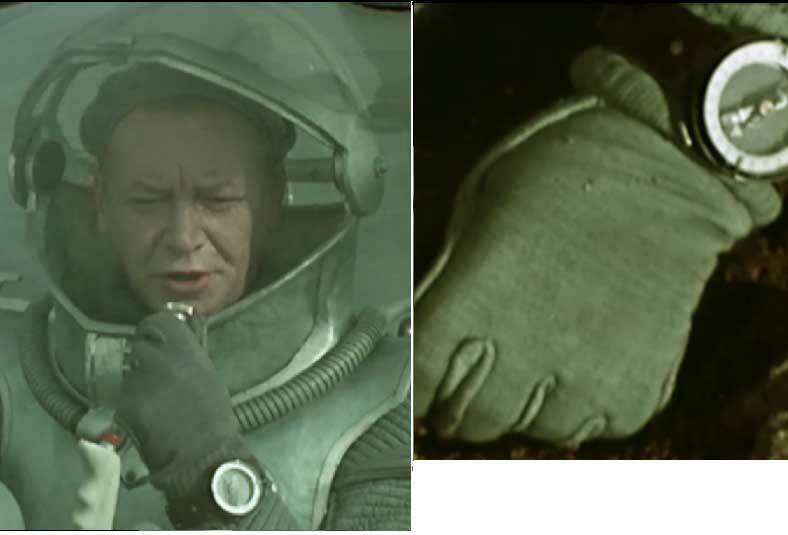 In the sci-fi movie Planet of Storms (Планета бурь, by Pavel Klushantsev, 1962), the astronauts on Venus are equipped with this compass! (follow the link for pic.). Bulgarian and Yugoslav (now Serbian) troops made by UGK. 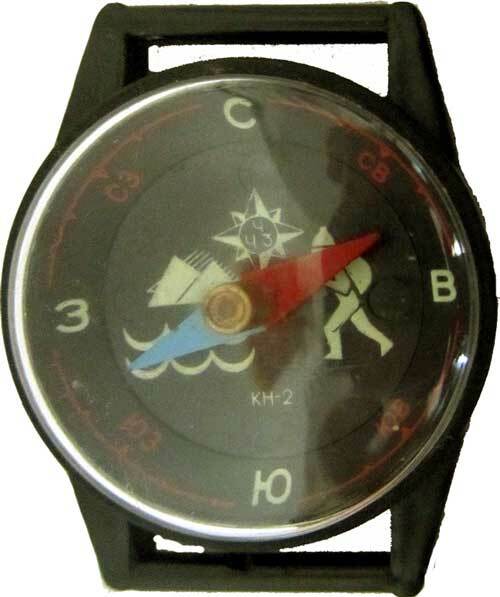 See also the plastic version Learner's Compass KA-Y. There was also a version with a floating card signed SEMIONOVA. PROFILE - former U.S. manufacturer (more information HERE). See also Pocket and Nautical compasses. 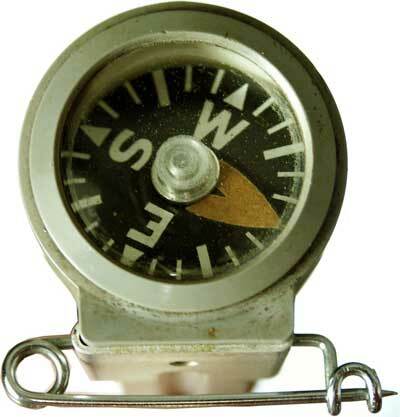 - Divisions: Letter for E, S and W cardinals, large arrow head of self luminescent paint for North. PROFILE - Aquastar is the brand name of ships and diving instruments (watches, compasses etc.). 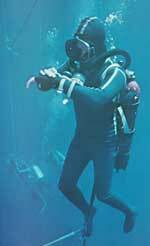 See also SCUBAPRO. PROFILE - ASKANIA is a German manufacturer (more information HERE). This compass type is the East-German, post WWII version of the Russian ADRIANOFF design made in the Soviet-Union by ZUP and AURKKA (see below). 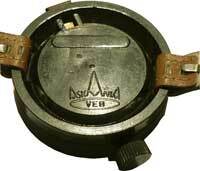 This one was built in the early '50s by VEB ASKANIA (East-Berlin). 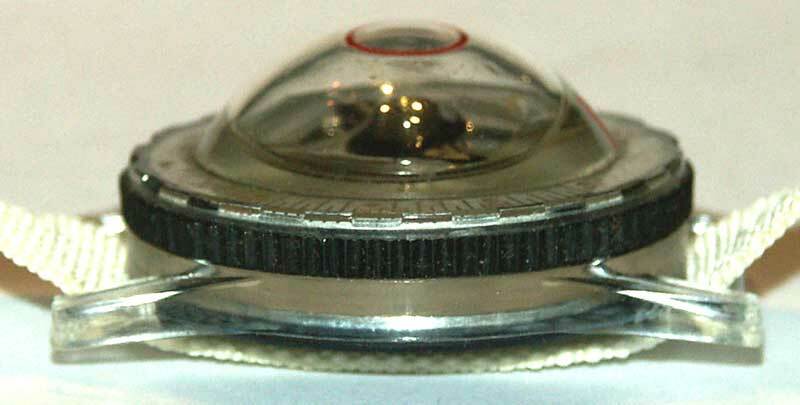 The 360 deg. 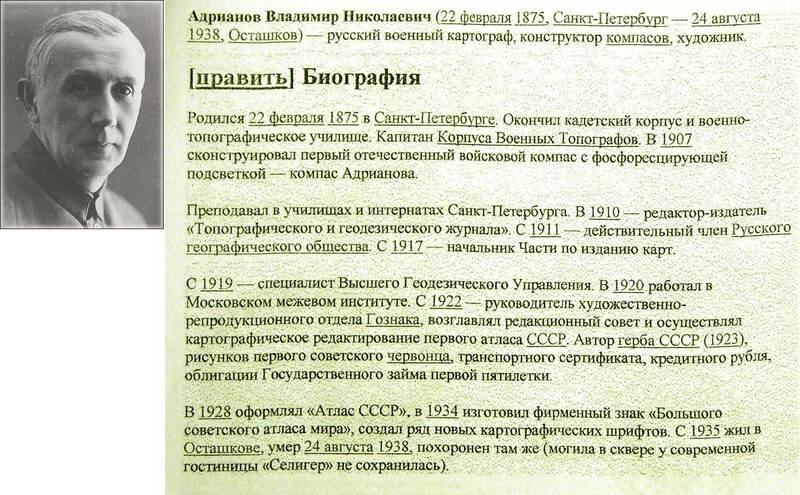 division shows that it is a civilian version. See also BAMBERG in the cat. 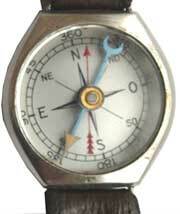 AERONAUTICAL Compasses and ASKANIA in MARCHING and SURVEY compasses. PROFILE - Nothing is known about this company. 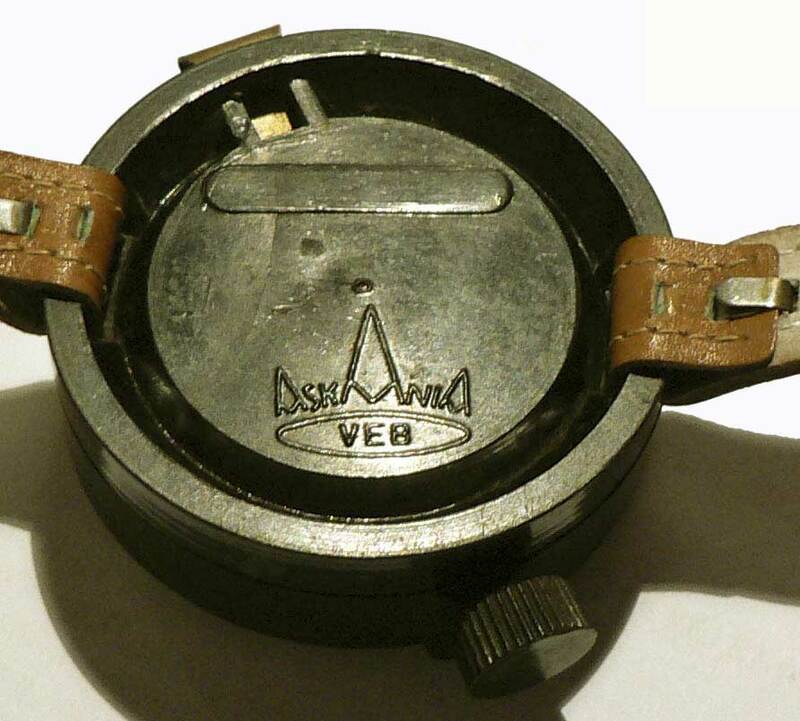 These compasses were made in Japan* but another object (a collapsible cup like the one we display in OTHER COMPASSES) also signed ATCO and displayed by the former Boreal Arrow website was made in Germany. The older one's strap is 14 inches long. 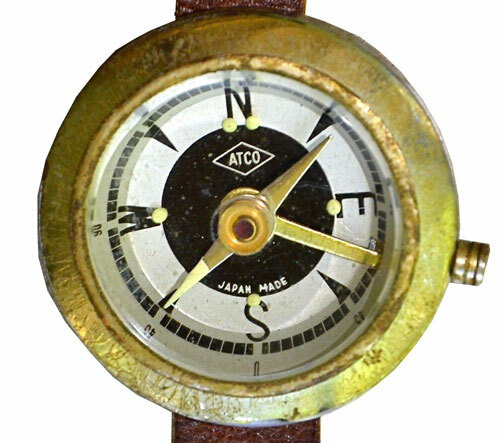 PROFILE - ADRIANOFF-type compass made by Мастерские артиллерийские управления Рабоче-Крестьянской Красной Армии (Masterskye Artilleriskoye Upravlenye Raboche-Krestianskoy Krasnoy Army) i.e. 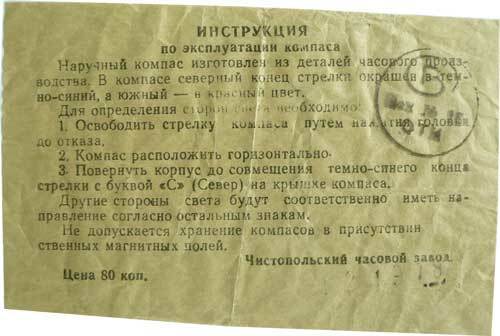 the Workshops of the Artillery's Administration of the Workers' and Peasants' Red Army. 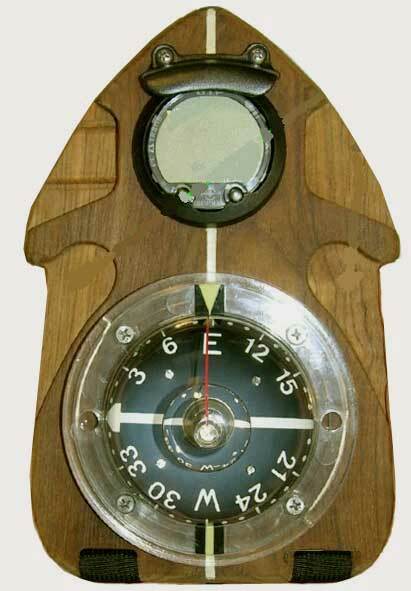 Same construction as the ZUP and ADRIANOVA compass. See also Marching, Escape, Pocket, Nautical and Survey compasses. 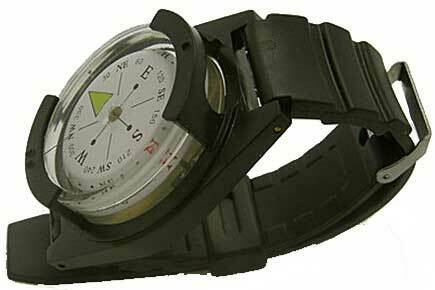 The crystal is protected by a leather cap and on the magnetic needle's North mark, the luminous product (tritium) is in a glass tube. R.G.S. 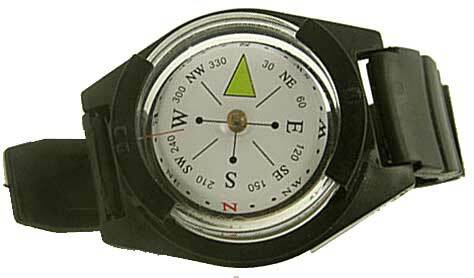 - The design of the dial on the compass below is referred to as the R.G.S. pattern in some catalogues published in the early 20th c. Barker tried indeed twice to register this design under the name Royal Geographical Society but this project was rejected (5th sept. 1903, number 416643 and 416644). Barker only used the abbreviation R.G.S. for no. 416645 without further explanation. The design no. 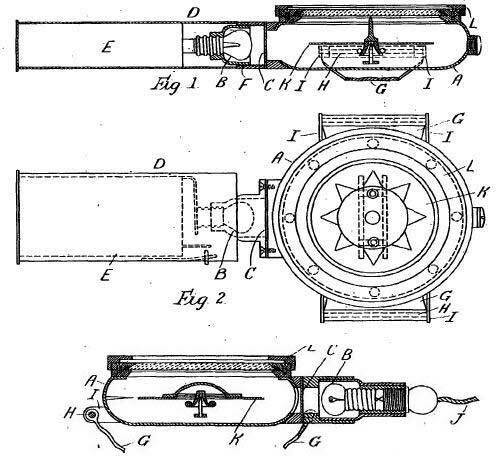 416645 was published on page 1318 of the Official Journal of patents dated 30th September 1903, covering designs registered in the week ending 17th September 1903. The owners were Francis Barker & Son, of 12 Clerkenwell Rd, London WC. The material class was Class I, covering metals. 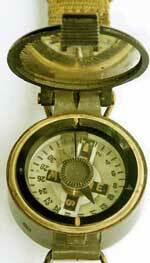 The following compass was built during the 50's and issued to the British troops. 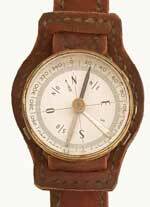 It was used during the Korea war and the Suez Canal expedition (1956). 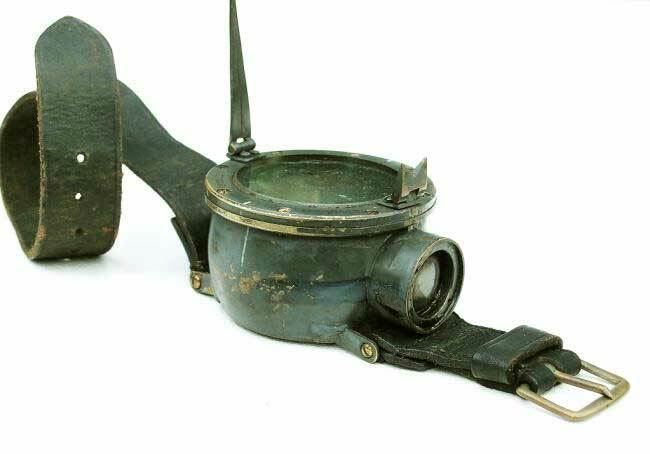 Its lack of precision lead the Military to use instead their classical hand-held marching compass (see Barker and Stanley). 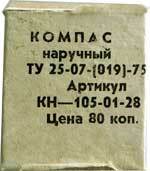 Moreover, its high radioactivity was the reason why it was no longer used. According to the RAF Stores numbering system (Book 7) the ref. 6B stands for "Instruments"
PROFILE - Abbrev. for Bianchetti Electronique Nautique. 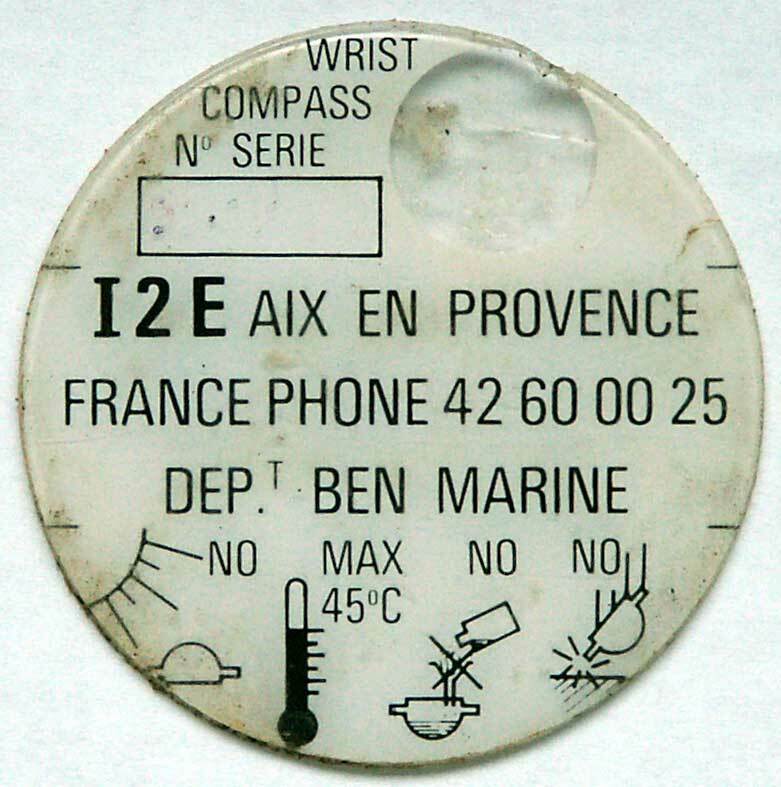 French manufacturer (more information HERE). BEN Marine is now a division of AMESYS. 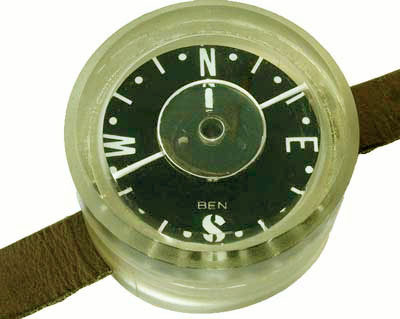 BEN built wrist compasses, among others this one resembling the LEMAIRE model used by the French Navy's Special Forces during the 1st Vietnam war (1946-1954) and the Algerian independance war (1957-1962). 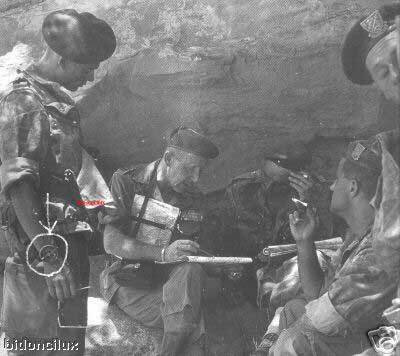 The black-and-white picture below shows a French soldier wearing an original compass in Algeria. 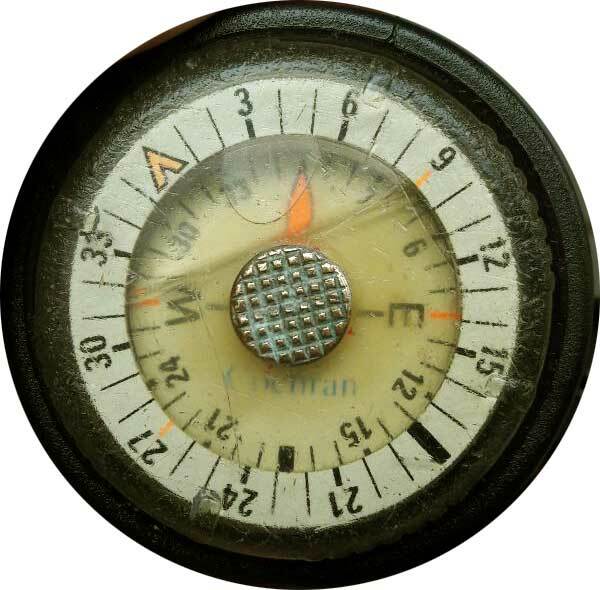 This compass combines the characteristic features of the white Czech KADLEC AK39 (sight elements on a crown without divisions, white line on glass) and the lateral screw-operated locking device of the crown like on british compasses (see T.G. Co. Ltd, Barker etc.). 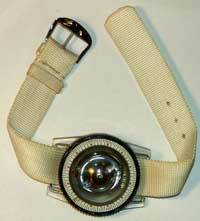 NOTE: The strap material is called a PoRoMeRic. (cf. WIKIPEDIA definition: Sometimes referred to as poromerics, poromeric imitation leathers are a group of synthetic 'breathable' leather substitutes made from a plastic coating (usually a polyurethane) on a fibrous base layer (typically a polyester). The name poromeric was coined by DuPont as a derivative of the terms microporous and polymeric. 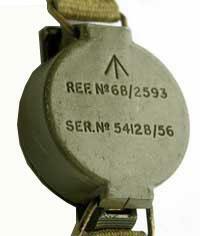 The first poromeric material was DuPont's ill-fated Corfam introduced in 1963 at the Chicago Shoe Show.). 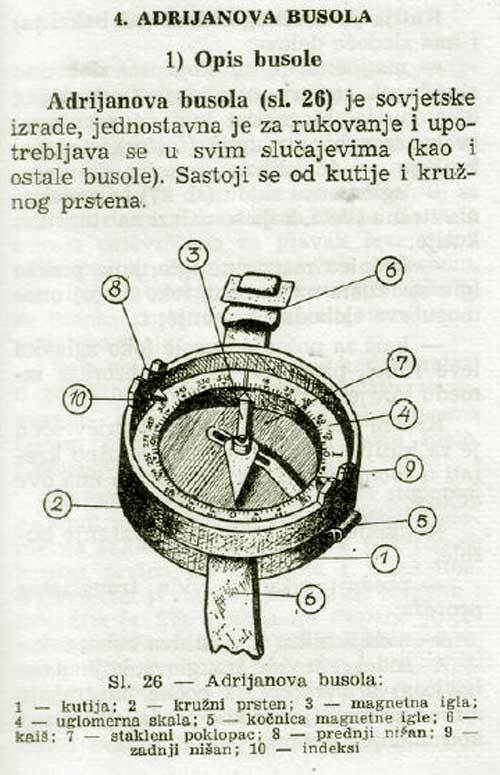 BEN also produced divers' compasses for SCUBAPRO, BEUCHAT or LA SPIROTECHNIQUE. 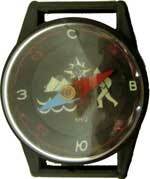 Several models were built and issued to the French and international armed forces, Police and rescue organizations. PROFILE - see special chapter THE BÉZARD COMPASS. 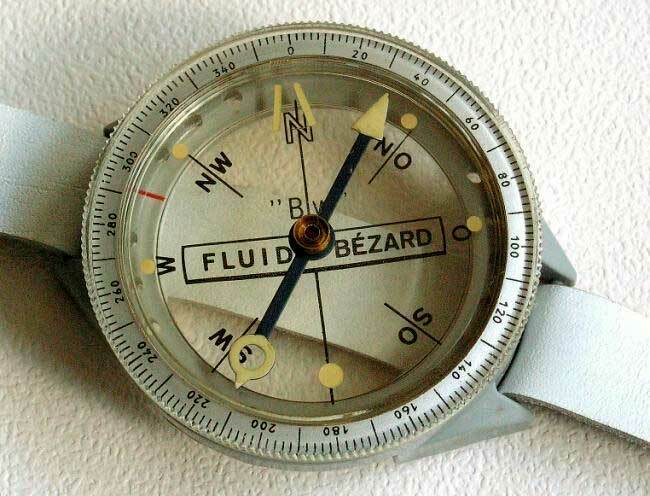 FLUID Bézard wrist compass - Model "Bw"
PROFILE - On this compass the cardinals are indicated with the letters common to the latin languages i.e. identical in French, Italian Spanish and Portuguese (see menue Miscell. 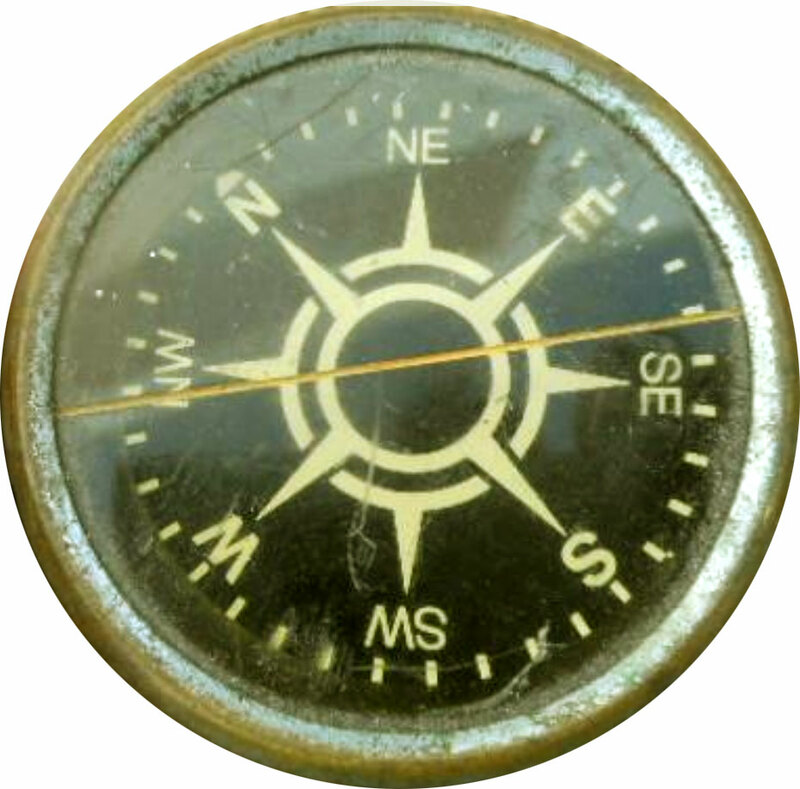 / cardinal points) but swapped left to right and the divisions are indicated counter-clockwise, a common feature on US survey instruments but not on wrist-top compasses. 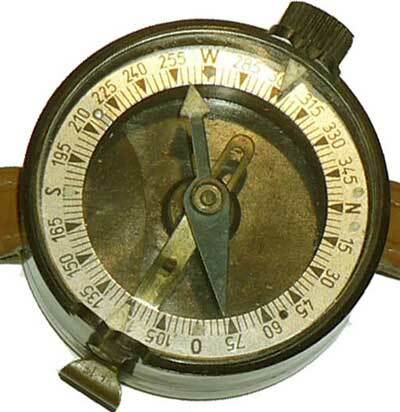 Moreover, the red arrow –which is not an adjustable hand but only a pointer printed on the dial to show the magnetic declination at the time the compass was made– points to approx. 15 deg. 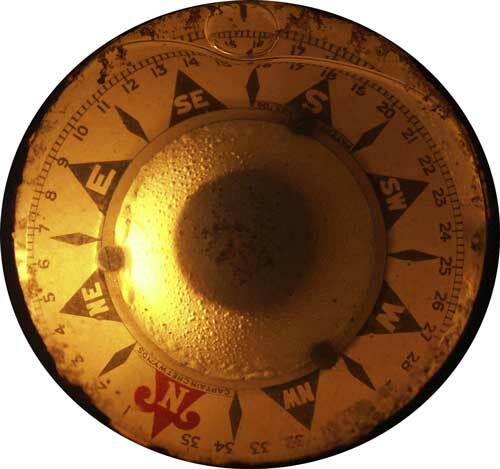 East (real direction, the divisions are inverted but this is another story) while this value was approx. 5 deg. 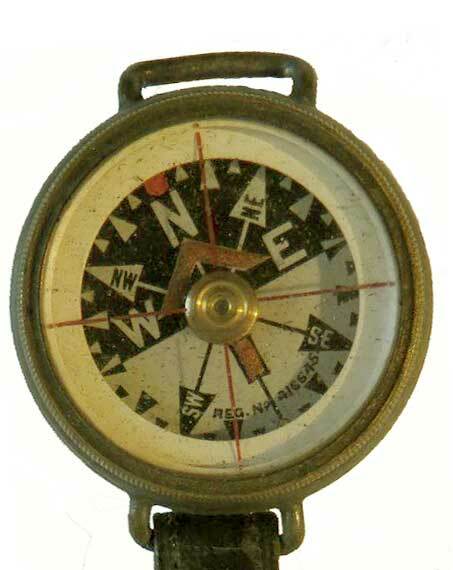 West in Europe when the compass was made, presumably around the mid 20th c. This would mean that this compass was intended to be used at some place where magnetic north was located eastward of the user. The only place in the world that matches this configuration is central Canada. 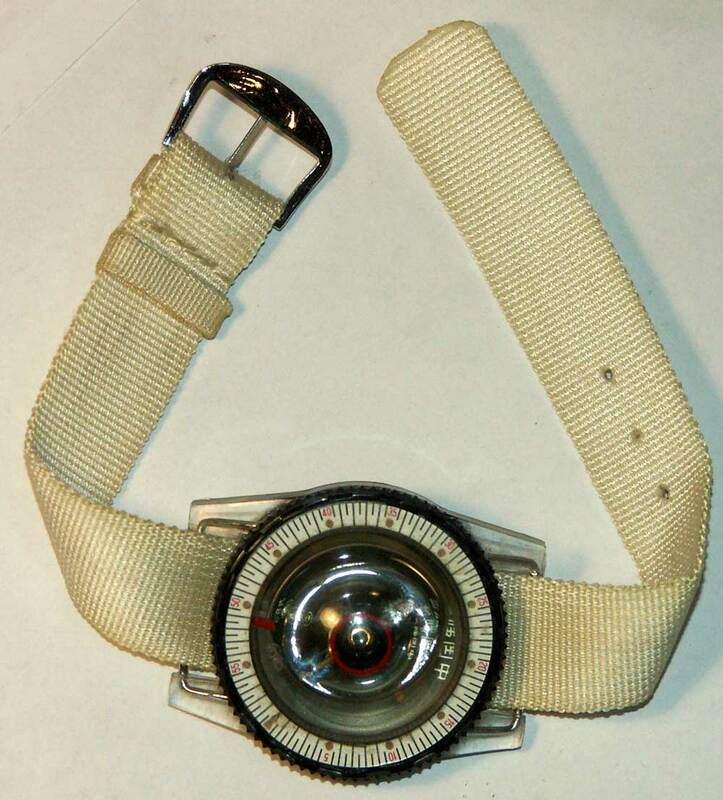 No manufacturer's name is engraved on the case but it resembles a wristwatch case made in Japan during WWII (Picture courtesy J. Petre). 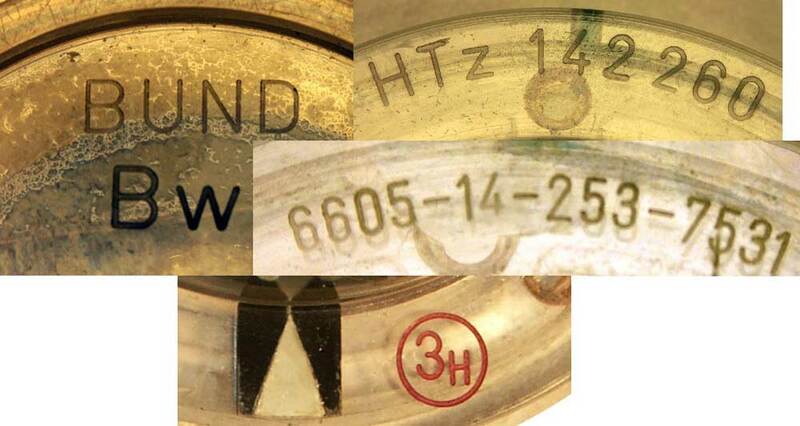 PROFILE - Ch-Ch-Z are the initials of the Russian watch maker Chistopolsky Chasovoy Zawod (i.e. 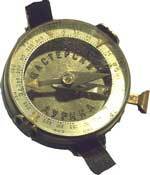 Chistopol Watch Company, name in cyrillic: see Instructions below). The city Chistopol is located on the river Volga in the Republic of Tatarstan (Capital: Kasan). Captain Louis Wentworth Pakington Chetwynd (b. 15 December 1866, d. 18 April 1914, read more details in the section Nautical Compasses) patented this compass that could be lit at night by means of a small lamp that fitted into a tube on the lefthand side. 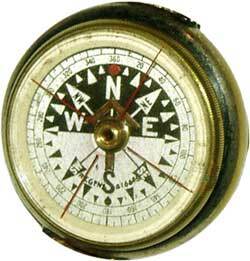 See also Marching and Nautical compasses and also WBT. 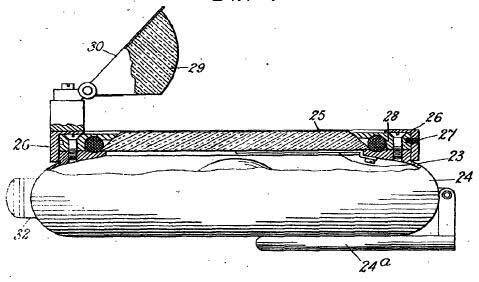 Click HERE to view the patent. Former U.S. retailer (addresses known: 40-42 Quincy Street in Chicago, Illinois and later 701 West Washington Boulevard, Chicago). 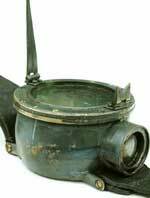 Scope: scientific Instruments, laboratory supplies, chemicals. 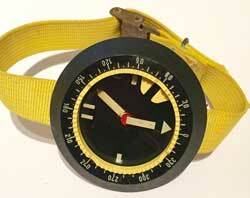 See also POCKET COMPASSES. 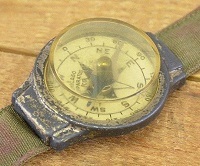 This compass features a strap in military look. However, it is not sure that it was used in the U.S. Army on a large scale because there are no luminous markings and no possibility to set a marching course. 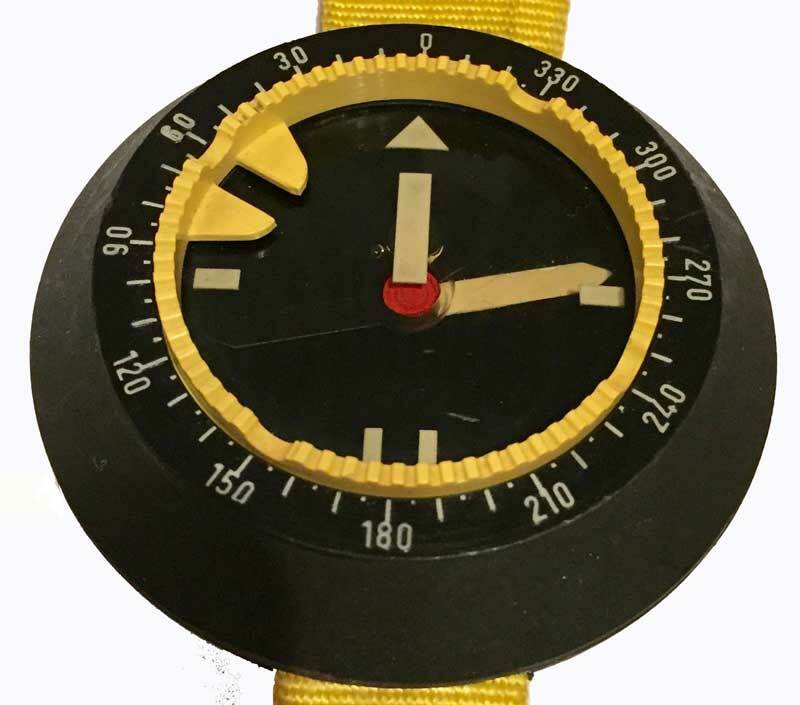 The name Cochran is printed on the dial but the company COCHRAN Undersea Technology (www.divecochran.com) told us that this instrument was made outside the U.S.A. and their records didn't go back that far (probably the 1980s). 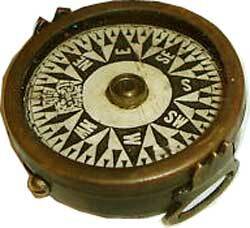 On the other side, we were told that this compass was made in Italy (see below). 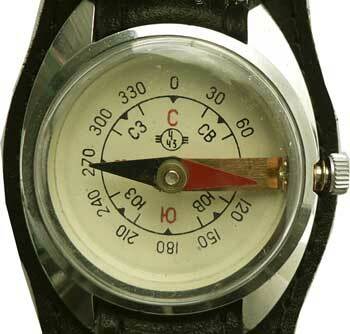 NOTE: A depth gauge featuring a similar design (knurled button) ist signed MEGA SPORT. Former French company successor of HOULLIOT located in the Marais district in Paris (more information HERE). 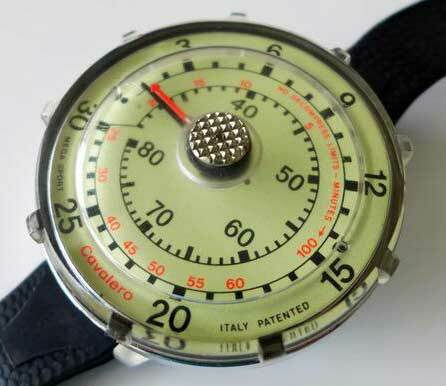 The original brass model (red strap) was replaced by a watch-type case made of Duralumine (grey strap). 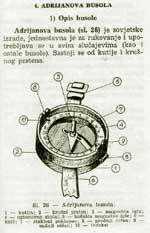 See also Pocket, Survey compasses and Sundials. Dia. : 30mm ; Length: 200mm. 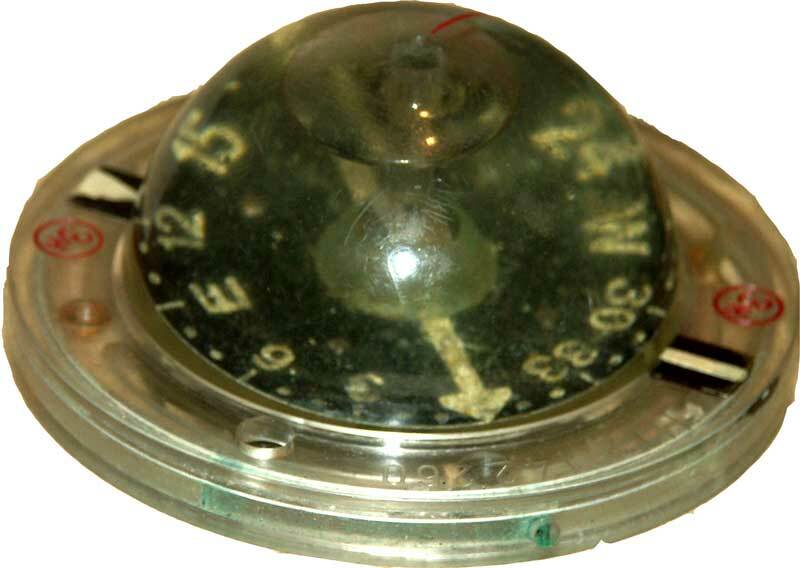 This model was available with and w/o luminous markings. 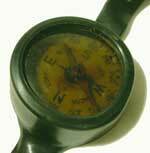 A soldier probably tinkered this instrument with a pocket compass (dia. 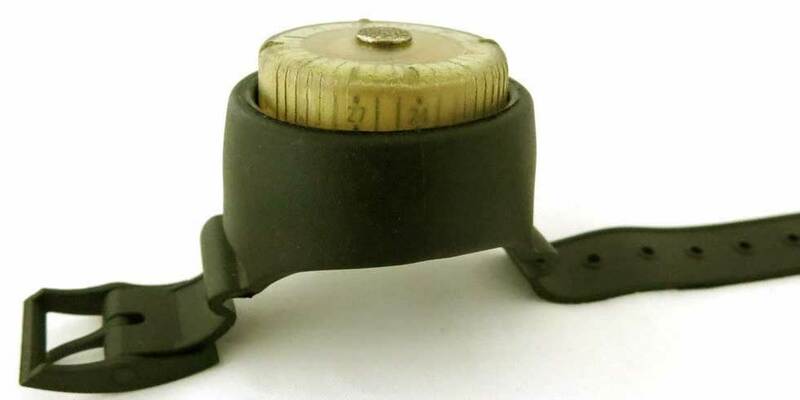 42mm) attached on a plate with claws. The loop was sawed off. Captain Frank Osborne Creagh-Osborne, Royal Navy (1867/1943) was Superintendent of Compasses with the Admiralty and a British inventor (s. his portrait HERE). 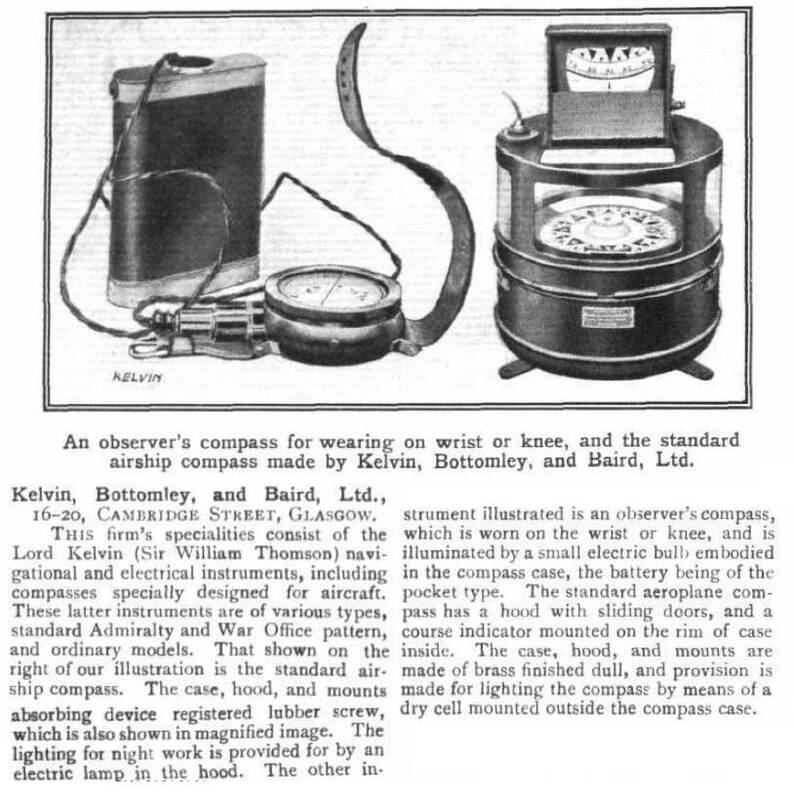 He patented several versions of this system (see below): His compasses were manufactured by H. Hughes & Son Ltd (59, Fenchurch Street London), Dent & Co, & Johnson Ltd. and by Sperry Gyroscopes. See also the categories Marching and Aeronautical compasses. 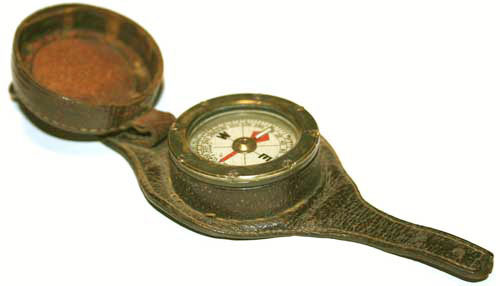 Compare to the marching compasses signed Creagh-Osborne and Hughes. 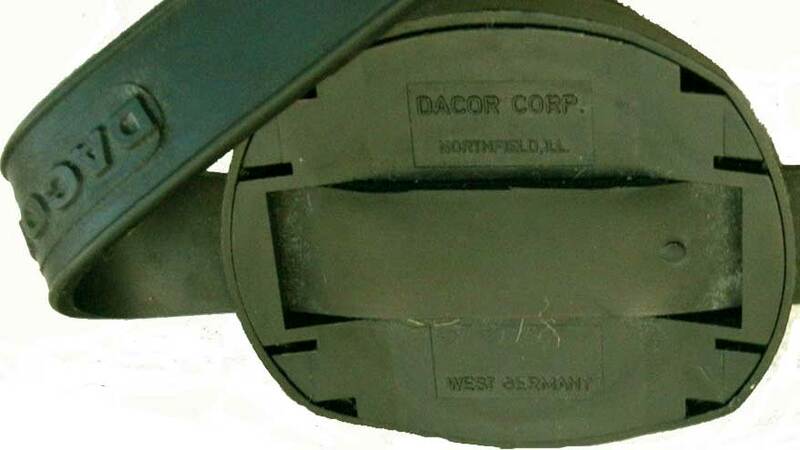 PROFILE - DACOR was a US company founded in 1954 by a former Marine soldier called Sam DAVISON. 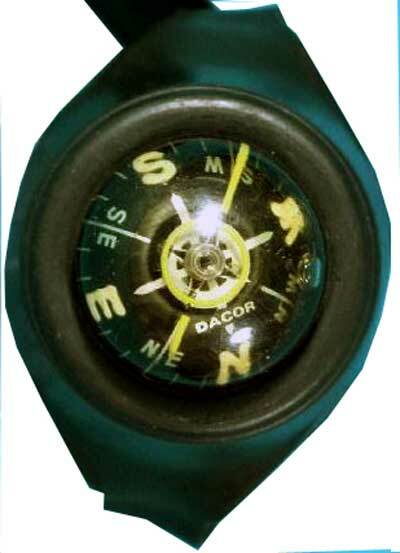 DACOR is an acronym built with the first syllable of his name DAvison and CORporation. It was consecutively located in Evanston, Illinois, in 1954, then in Skokie, Illinois (about 1965) and at last in Northfield, Illinois. 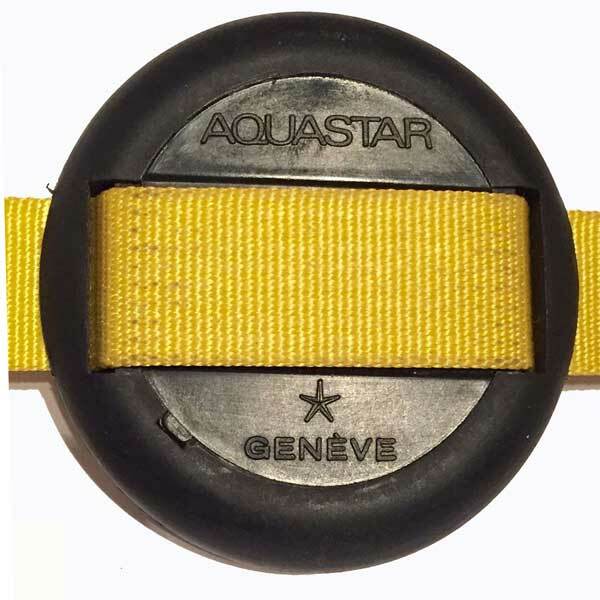 It was bought by the Italian MARES (diving gear) in the early 2000's. This item features winglets under the magnetic needle which are typical for WILKIE's compasses. 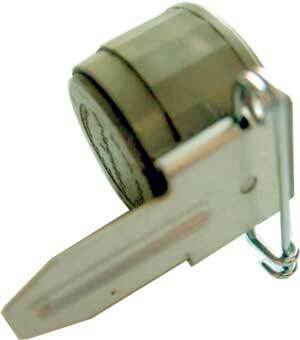 PROFILE - DINSMORE is a U.S. company located in Flint, Michigan. 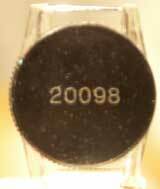 It was founded in 1927 (tbc) by Clarence B. "Dinny" DINSMORE. His son Robert C. (born Dec. 22, 1919 - died Dec. 15, 2009) continued but sold the rights in 2001 to the 'The Robson Company' (TRC). 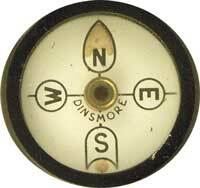 Dinsmore was the world's first maker of car compasses and has had approx. eighty years of experience, and many patents for the correction of vehicle caused anomalies in compass readings. 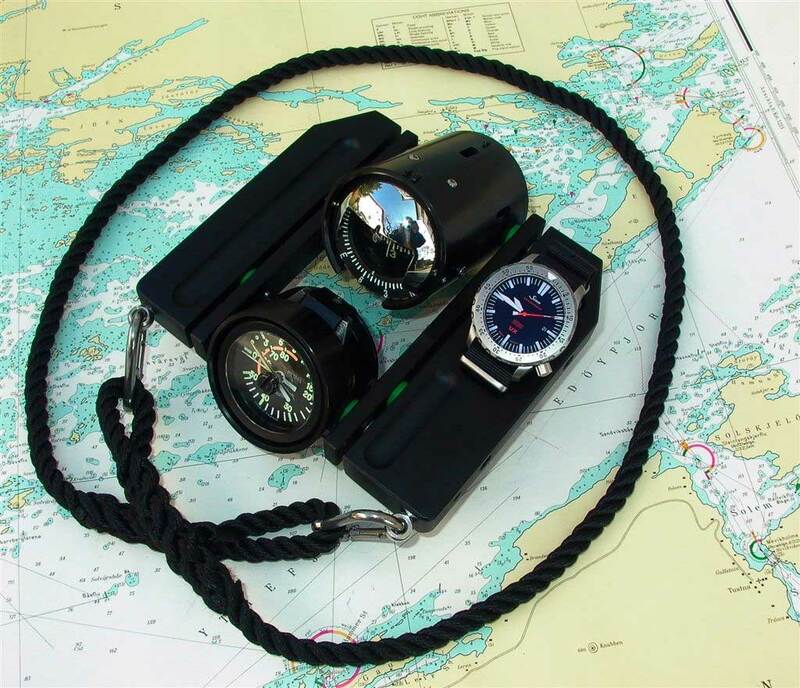 Dinsmore has designed and manufactured compasses for special uses as well as aircraft, mariners and vehicular compasses. See also R. C. Dinsmore's obituary. 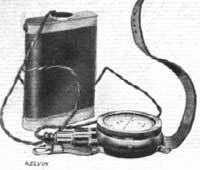 "I believe that Dinny worked for Albert Champion, founder of AC Spark Plug and Champion plugs back in the 1920’s. 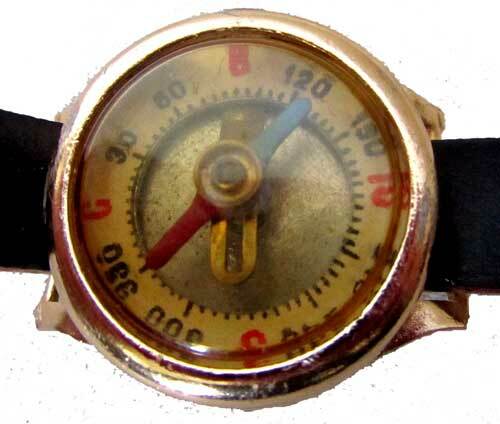 There was a company in the East trying to work their way into the automobile gage business, which Mr. Champion had a corner on the market because the center of automobiles was in the Flint and Detroit areas in the 1920’s. 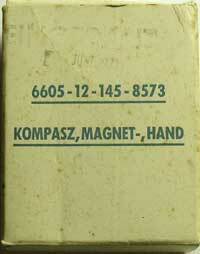 This other company specialized in aircraft gages. 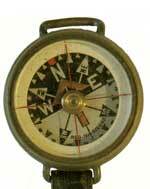 So Albert asked Dinny to design a compass that would work in any position. 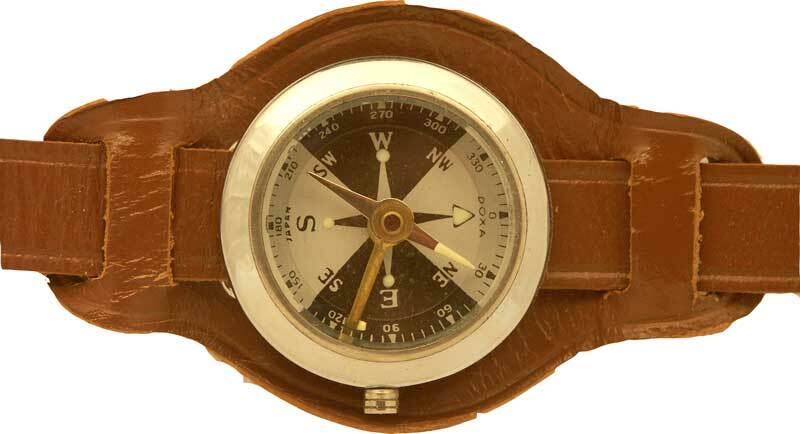 When Dinny brought the compass to Albert, Albert sent it to the competitor and said "if you don’t stop making auto gages I will market this compass which can be used in airplanes". They withdrew from the auto market. 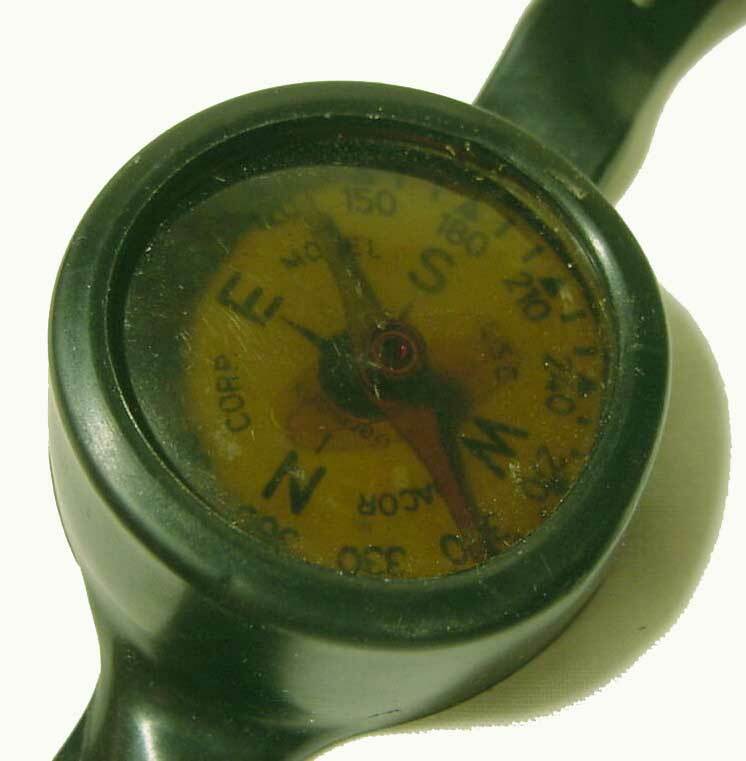 Albert having won his battle had no use for the compass so he gave the rights to Dinny, who patented them and started the Dinsmore Instrument Company." 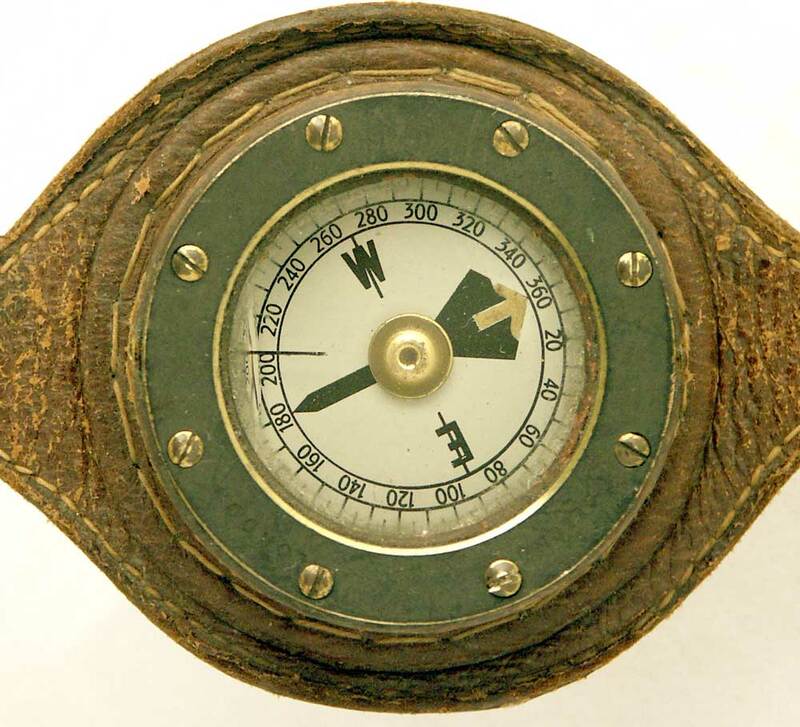 This museum only displays vintage divers' compasses. To read the description pls. 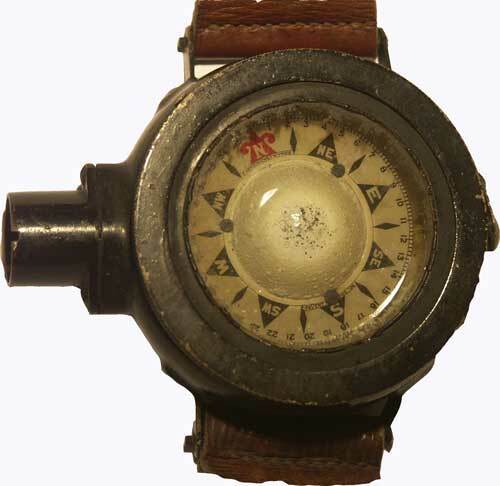 follow the links: BEN, FPM, Hand, Heinke, KNM (KHM), Mikrotechna, Nemrod, NVA (former East German Army), Panerai, Scubapro, Spirotechnique, Steward, Suunto, Taylor, Triton, Waltham, Wilkie, ... (to be cont'd). 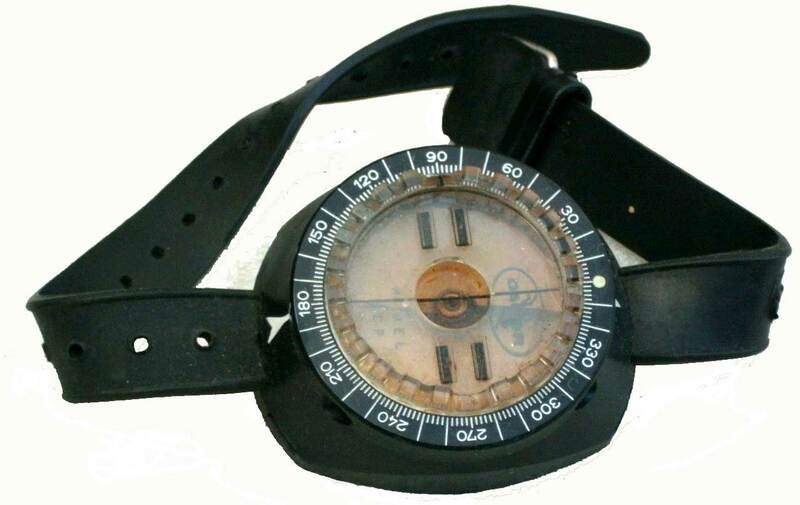 Unbranded divers' compass probably made in the US in the 1960s. 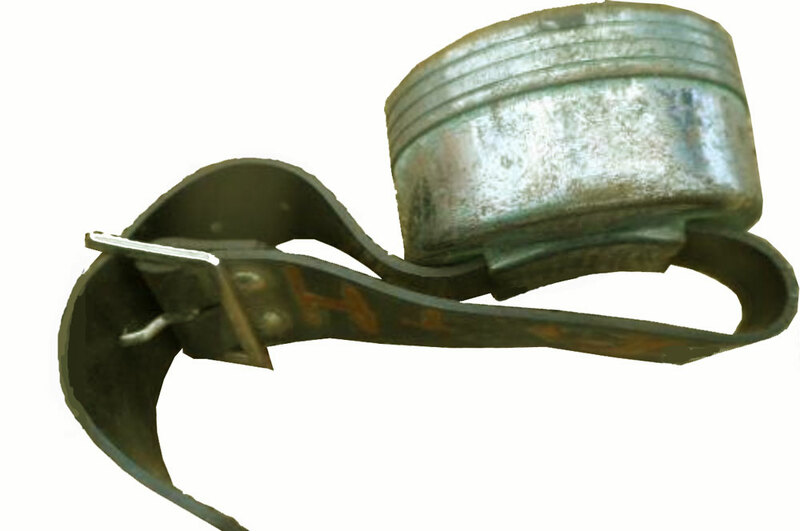 If you recognize this instrument in an old catalog, pls. send us a copy of it and all other available information. Many thanks in advance. 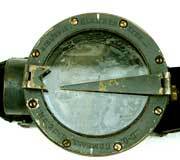 A very special device is the navigation board used by the Underwater Demolition Teams (UDTs - U.S. Navy Seals), the UK Royal Navy's Special Boat Service (SBS) and the German Spezialisierte Einsatzkräfte Marine (SEK-M) which consists of an instrument panel held by the team leader in front of him while advancing. The other team members follow him holding a buddy line. 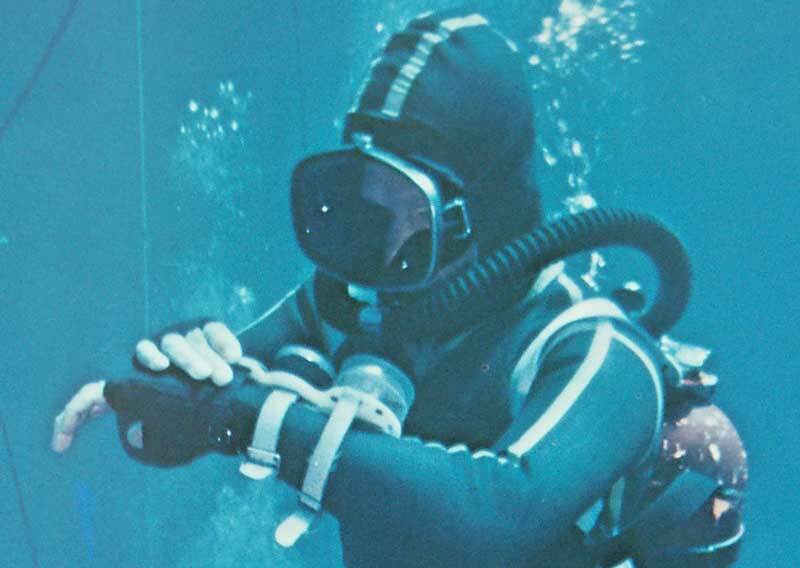 A new system designed by Franz Rothbrust and built by the German compass manufacturer LUDOLPH (see pic at right) has many advantages upon the standard NATO system: it is about half as large and features in addition a mirror above the FK 16 aircraft compass (ask for full description in English - pdf) permitting to be sure the other divers are following. 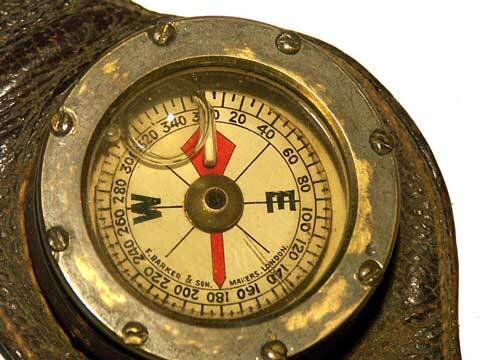 See examples of navigation boards used by the French Forces divers (Commando Hubert / Marine) on the website Collection of diver compasses, boards and other instruments. Navigation board of the German forces' underwater demolition teams (Bw-Kampfschwimmer) featuring a compass made by Spirotechnique and BEN (mfr no. HTz C1150, now AMESYS) from ca. 1968 on. 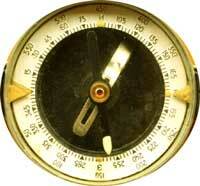 PROFILE - British instruments manufacturer and retailer, now D&A, Dollond & Aitchison (more information HERE). 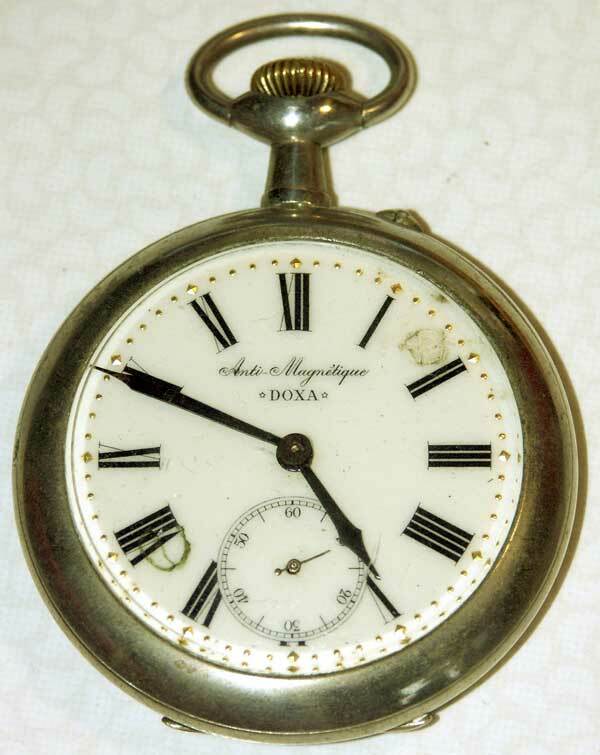 PROFILE - DOXA was a Swiss clock manufacturer. 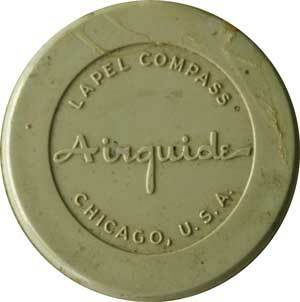 From the 1960s on, the brand was used by a Japanese company for numerous wrist and pocket compasses. 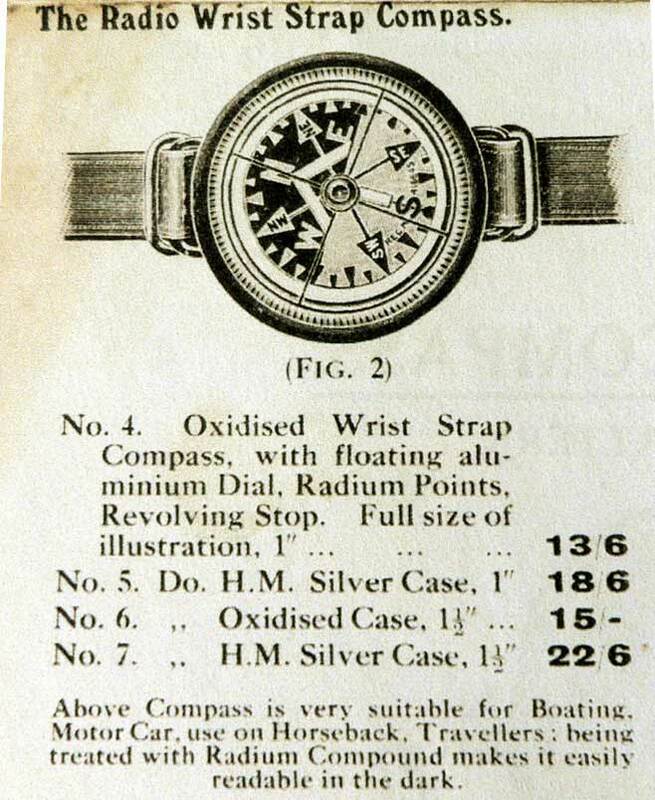 This compass appears in a MITSUI catalogue together with several other compasses. 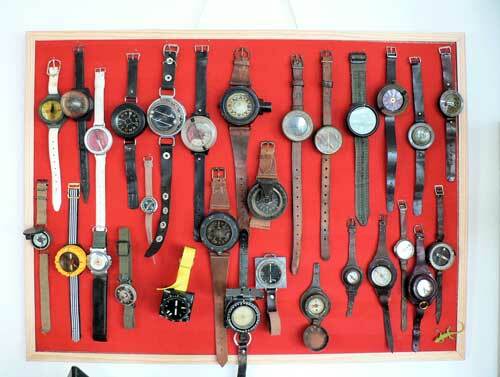 Picture at right: railroad driver watch late 19th C.